What to knit with small amounts of color coordinated yarn when stripes no longer fulfill the need for artistic expression? 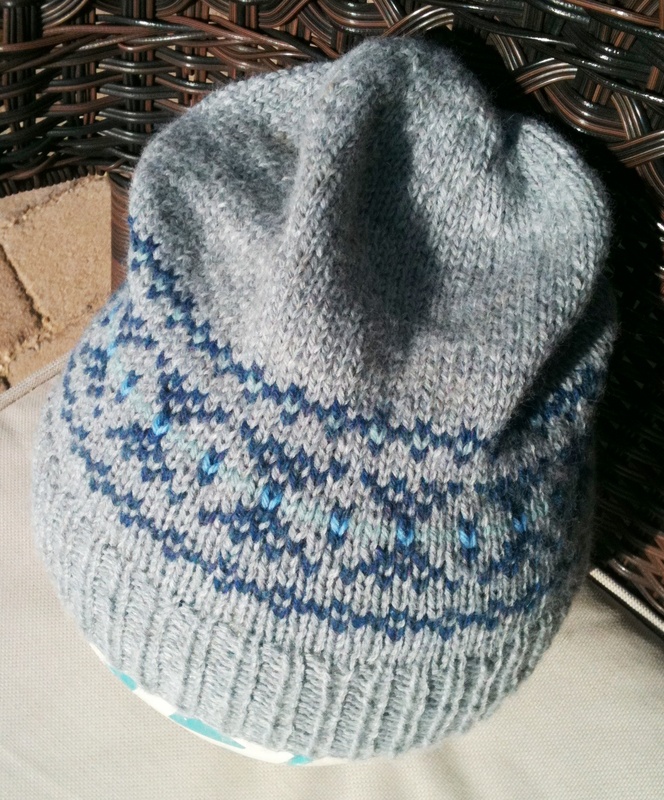 More Slouch Hats – but this time with a Fair Isle pattern. I am told that knitting Fair Isle patterns is also referred to as “stranded”. “Fair Isle” sounds all Celtic and mystical. “Stranded” sounds like my car died in a snow storm, so Fair Isle it is. Knitting Fair Isle requires carrying one color yarn loosely behind another (typically, there are only 2 colors in each row). As there are no more than 3 stitches between color changes in this pattern, there is no need for twisting the yarn. 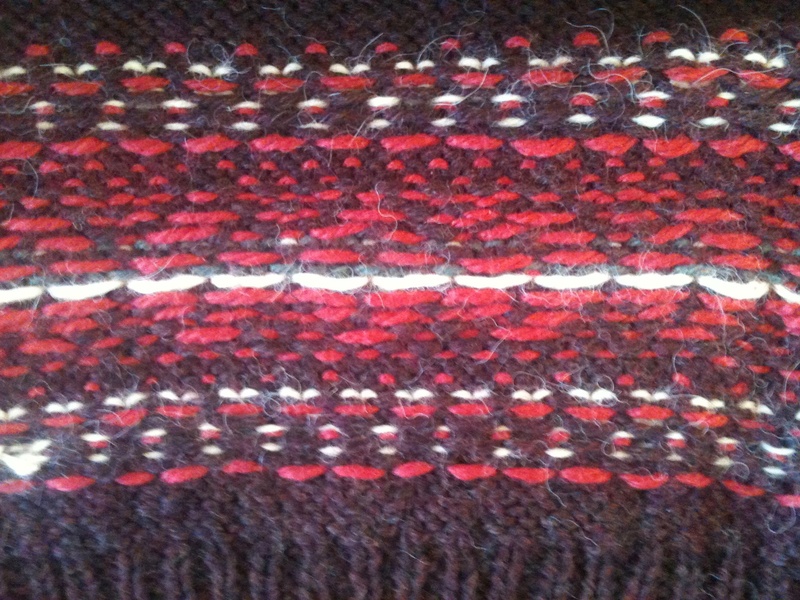 For more hints on Fair Isle knitting scroll down to bottom of this post. This pattern is written for Worsted or Aran weight yarn (size 7 US = 4.5 mm needles) or DK weight (size 5 US = 3.75 mm needles). DK just requires a few more stitches and rows. Row 1 = K3 Red, K1 Blue, K1 Red. Row 2 = K1 Red, K3 Blue, K1 Red. Row 3: K2 Green, K1 Blue, K2 Green. In the Pattern below, the Worsted/Aran weight stitches are the first numbers, the DK are in red in the parenthesis. Using size 5 (4) circular needles (16″ long works well) and main color, cast on 90 (100) stitches. Place a marker and join without twisting. Knit K1, P1 ribbing for 2.5″. Change to size 7 (5) circular needles (also 16″ long) and increase to 105 (120) stitches in first row. First row and all remaining rows are now Knit Every Stitch. Knit two more rows with main color. 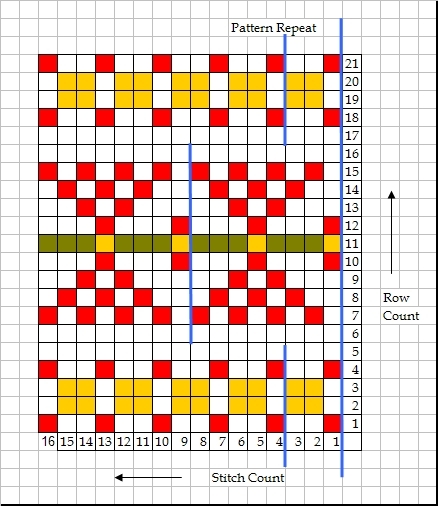 Using chart, knit Fair Isle Pattern (double click on it and it will enlarge) Knit rows 1 – 4. For worsted weight, decrease 1 stitch in Row 5 to 104 stitches. There is no decrease required for the dk, the number of stitches remains 120 stitches. Knit rows 6 – 15 from chart. For worsted weight increase 1 stitch in Row 16 to 105 stitches. There is no increase required for the dk, the number of stitches remains 120 stitches. Many thanks to the commenters who noticed that the original stitch repeat was incorrect on the chart. 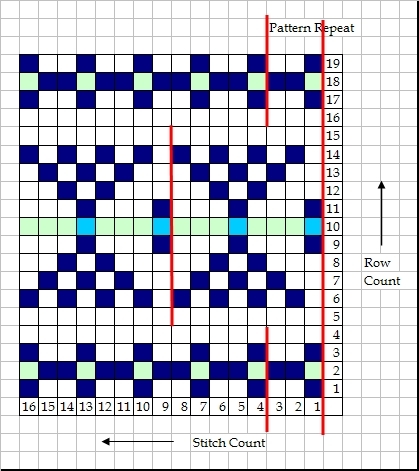 The revised chart notes that the upper and lower color bands (Rows 1 – 3 and 17 – 19) have a 3-stitch repeat. The middle section (Rows 6 – 14) have an 8-stitch repeat. The stitch repeats are identified by the vertical red lines. 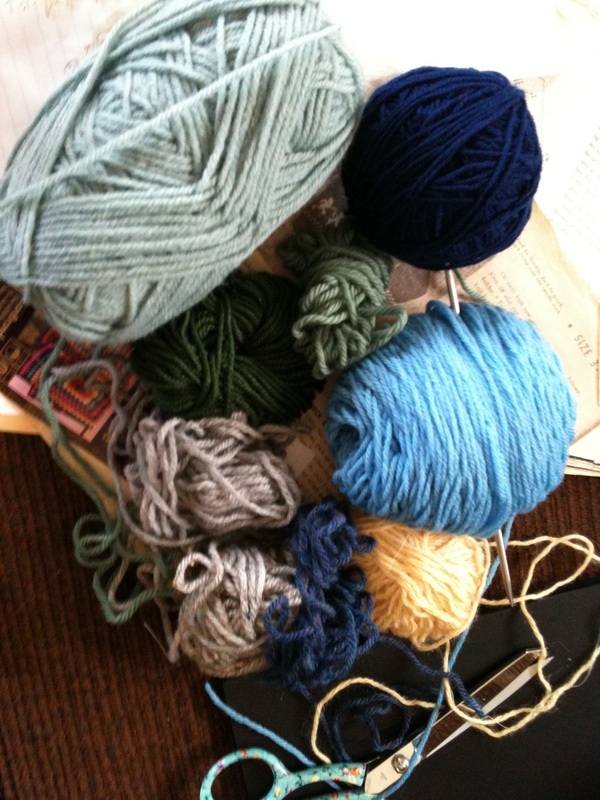 Carry contrasting yarn loosely in back of work. Leave tails of contrasting yarn at least 6″ long for weaving in when knitting is completed. 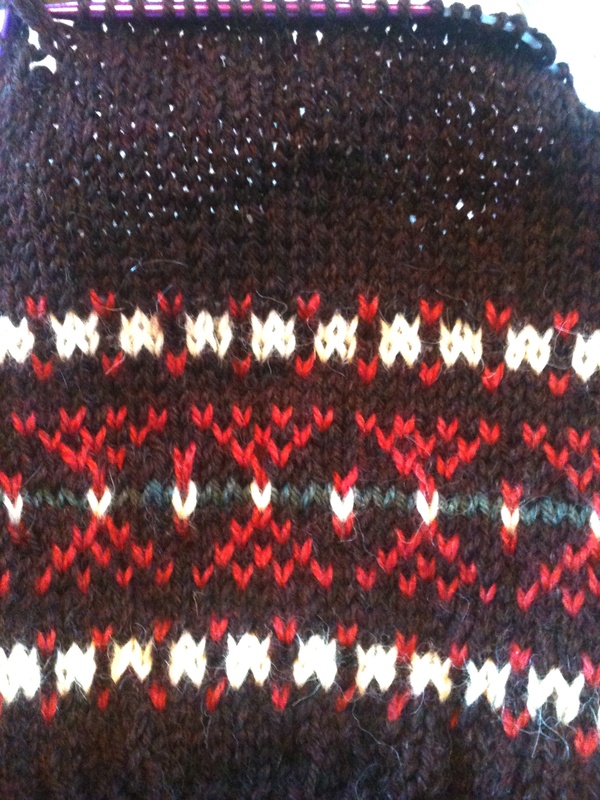 After Fair Isle Pattern is complete, continue knitting with main color until hat is 8.5 inches long (including ribbing). K3, *K2tog, K10*. Repeat between * and * to end of row. K8, *K2tog, K9*. Repeat between * and * to end of row. K5, *K2tog, K8*. Repeat between * and * to end of row. K0, *K2tog, K7*. Repeat between * and * to end of row. K2, *K2tog, K6*. Repeat between * and * to end of row. K4, *K2tog, K5*. Repeat between * and * to end of row. K0, *K2tog, K4*. Repeat between * and * to end of row. K1, *K2tog, K3*. Repeat between * and * to end of row. *K2, K2tog*. Repeat between * and * to end of row. Cut tail 10″ – 15″ and thread through large eyed sewing/darning needle. Thread tail through remaining stitches and draw tightly closed. Secure by back stitching and weaving though on wrong side. Secure contrasting color yarn tails by weaving through stitches of same color yarn. 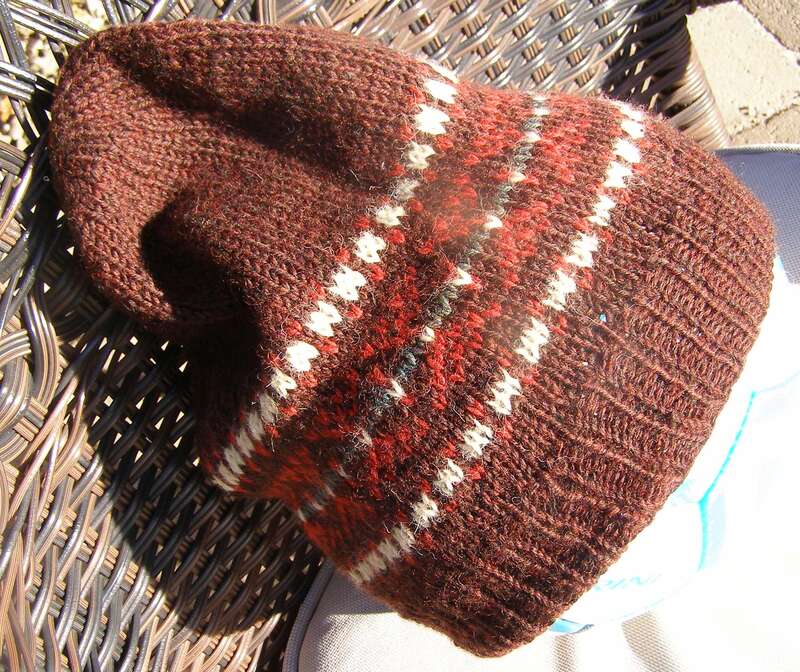 After photographing the brown/red hat knit in DK yarn, I noticed I had added two rows to the color chart. Row 2 and Row 18 of the original pattern had been repeated. The Color Chart to the right reflects this change. It has also been revised to indicate the corrected Pattern Repeat identified by commenters. If carries are too tight, the hat will not stretch to fit an adult head and the colors will appear “squished”. Practicing carries with straight needles to become acquainted with the appropriate carry tension might help tight knitters. 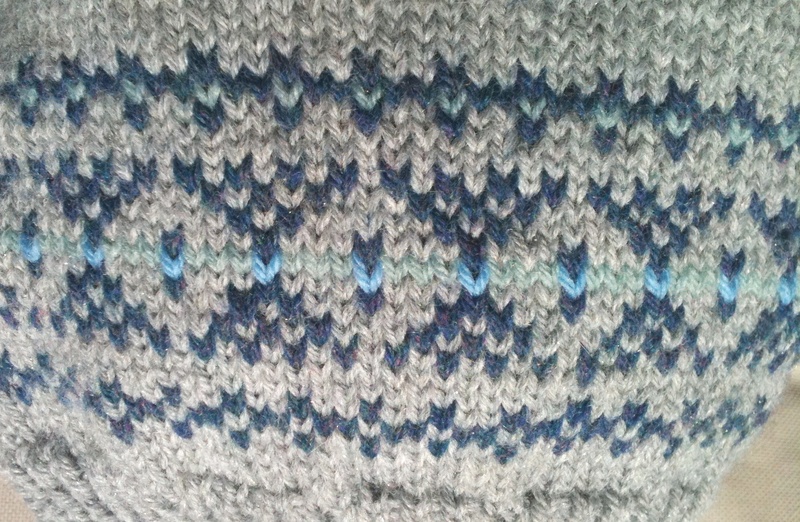 Some stitches in Fair Isle may seem to “fade” into or hide behind those stitches around it. Using the point of a small knitting needle, gently pull the stitch out of hiding. Once “freed” from being behind it neighbors, it should remain visible. Some stitches (especially near row starts) may appear too large. Tug gently on the carry (back side) near the stitch to close up the size. Fair Isle knitting looks best with “fat” yarn. Since yarn cannot be put on a weight gain regiment, needle sizes are typically one size smaller than recommended for a yarn. This entry was posted in Accessories, Beginner Knitting Project, Fair Isle Knitting, Free Knitting Pattern, Hat, Knitting, Stash Couture, Tutorial and tagged Free Knit Hat Fair Isle, Slouch hat Free Pattern. Bookmark the permalink. Thank you for letting me know that the graphics created confusion. I will attempt to revise. The charts have been revised to better identify the Pattern Repeats. The repeat for the upper and lower color bands (Rows 1 – 3 and 17 – 19) are only a 3 stitch repeat. The middle color section (Rows 6 – 14) has an 8-stitch repeat. Chart question: Rounds 1,2&3 and 19,20&21 look like two colors should alternate in a repeat alternating 1 and 2 stitches. However, each row ends with a single stitch of the same color. This would result in one repeat of 2,2 stitches. I’m not sure if I’ve explained myself clearly. I notice that this repeat doesn’t appear in any of the pictures I’ve seen. Is the chart correct? Thank you so much for the pattern! I have wanted to try some Fair Isle knitting for a while but it seemed a bit daunting. Your chart was very easy to follow so it was a great place to start. I managed to knit my hat in just a couple of days, which is pretty quick for me. (And I managed to use some of the left over yarn from other projects.) Thanks again. So glad to hear the pattern worked well for you. Isn’t it rewarding to use yarn from The Stash? What is your thoughts on yarn type acrylic or wool acrylic blend? I am a long time “dyed in the wool-ie.” It is much more enjoyable to knit with. However, the recipient has to be the guide for yarn choice for the main color/yarn of the hat. Many of my potential recipients (family and friends) cannot tolerate wool directly against their skin – and the hat band will be directly against the forehead. For those recipients, the choice for main color/yarn is acrylic, although I have also used a cotton/alpaca blend. I’m trying this hat…… but I still don’t think it works out. 3 doesn’t divide into 104 evenly. Shouldn’t it be a 4-stitch repeat (1 stitch with cc, 3 with mc) for that first row? 4 divides into 104 26 times. If you use your repeat for that first row, you end up with 1 stitch after the last time you use the contrast color, not 2 stitches as your repeat would suggest. I am trying to knit this hat, but I still don’t think the repeat works. For a 3-stitch repeat on row 1 to work, the number of stitches (104) would have to be divisible by 3….. and it is not. I think it should be a 4-stitch repeat (k1 with cc, k 3 with mc) for row 1, and then row 2 and 3 would also follow a 4-stitch repeat. This also makes this section line up properly with the middle section of the chart, because the rest of the chart is an 8-stitch repeat. The way you have it, the top and bottom does not line up properly, at least to my eye. I think you are correct, a 4 (or 2) stitch repeat for the lower (and upper) designs may be the answer. Or if the original design is desired, add one stitch (to 105) for those bands and decrease back to 104 for the middle design section. Thanks for pointing out this error. I will attempt to correct the charts. I have corrected the pattern stitch count for the smaller size. I hope it is now correct. Please, if anyone notices a problem.. just let me know. This seems to be a knitting community pattern – but eventually we will combine efforts to get it right! I looked up a knitting needle conversion table and it looks like a US size 5 is a 3.75mm and a US size 7 is a 4.5 mm. I hope that helps! The grey was left over Vanna Choice in Grey Marl. I had used the yarn to knit the Waffle Stitch Scarf. 105 stitches does not work out for 8 repeat??? You are correct, 105 does not work. Further down in the revised instructions – after the band is complete – there should be a “decrease one stitch to 104 stitches.” The 104 stitches should work with the 8 Stitch repeat. I am confused on the ending of the hat when we start the decreases. It seems the stitches in the decrease rows don’t add up to the 105 or 120 to make a complete round? I am confused about the hat decrease rounds. I have 105 stitches but the numbers of stitches in the decrease rows seem like I will end up in the middle of the pattern at then end of the row. We’re the decrease rows supposed to have a number of stitches that would allow you to complete the pattern at the end of the row? I am not sure I am following your question correctly, but I hope this will help. Yes, the last decrease stitch will not correspond to the last stitch of the row. There is a certain number of stitches between the last decrease and the end of the row. But I specifically choose not to include that number in the instructions. I remember learning to knit and for some reason at that time, I thought the EXACT stitch count was vitally important – and spent too much time counting and raveling and counting and raveling. I wanted to be sure that this pattern did not cause such anxiety (and counting and raveling…) Although they are related, the shape of the hat is more important that the exact stitch count. 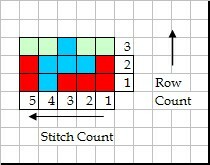 Each decrease row should identify how many stitches before the first decrease and then the number of stitches between each decrease. I purposefully did not specify how many stitches would then be knit from the last decrease to the end of the row to eliminate unnecessary worry. 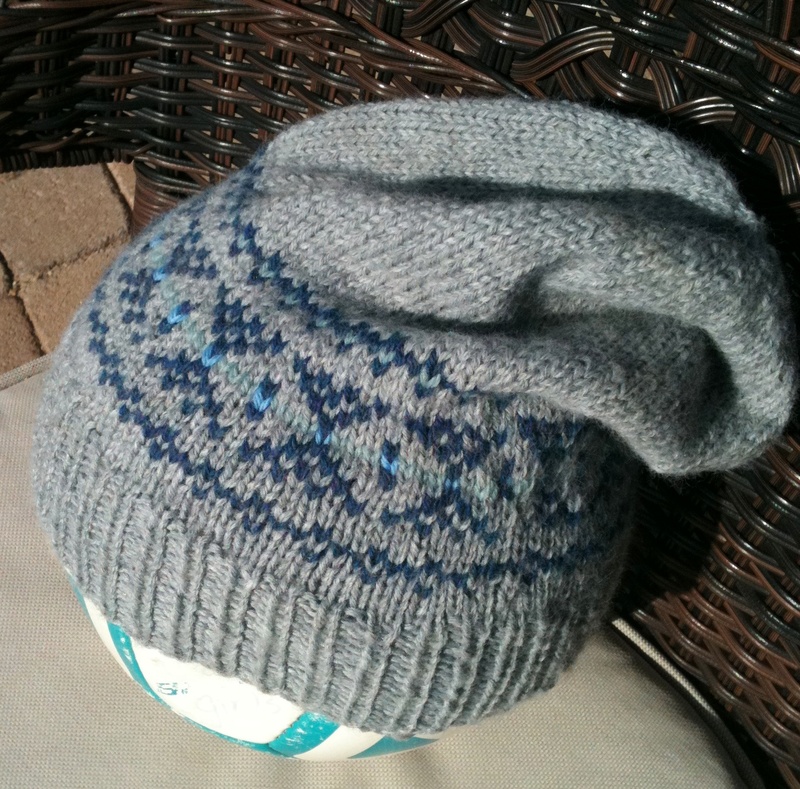 If it is off by a stitch or two, the hat will still have a hat shape and the knitter will enjoy the project much more!